We have all seen pictures of celebrities stumbling out of nightclubs accompanied by a light dusting of white powder around their nostrils. In some cases, we have seen A-listers brazenly snort the substance, oblivious that their actions are being caught on camera. So it was no surprise when celebrity chef Gordon Ramsay announced that the cocaine culture in Hollywood is “out of control”. Ramsay, the unlikely whistleblower on A-list drug culture, made the surprising revelation on his new show, Gordon Ramsay on Cocaine. In true Gordon Ramsay style, the outspoken chef made some further claims about the celebrity habit for the “white stuff”. “I saw cocaine quite early on in my career. I’ve been served it. I’ve been given it”, said Ramsay during the show, in which he travels to Colombia to explore the coca farms. In a preview clip, Ramsey visits a coca farm deep in the Columbian rainforest to see the process which involves covering the leaves in cement powder, sulphuric acid, petroleum and battery acid. “I’ve cooked some serious s**t in my life but nothing quite on this level,” the outspoken chef said. 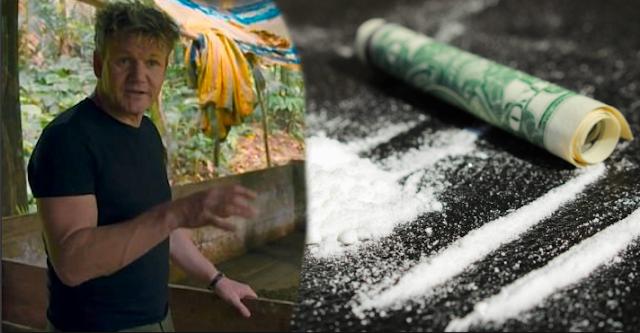 “No wonder these little labs don’t get busted, because we’re going deeper than I could ever imagine,” an out of breath Ramsay says, as he treks into the “remote” wilderness for an exclusive tour of a coca farm. The production, which Ramsay likens to “f***king Harry Potter”, is a long and arduous process. But with 30 tonnes of the drug being sold in the UK alone every year, it is easy to understand why coca farmers do it. “With soaring cocaine deaths in Britain and along the coke supply chain, I’m determined to understand the criminal business behind this deadly drug,” Ramsay tells the camera. But, that wasn’t all that he divulged. In 2003, Ramsay witnessed the devastating effects of cocaine first-hand, when his head chef, David Dempsey, fell to his death after a bizarre drug-fuelled rampage. Dempsey, a very close friend of Ramsay’s, had cocaine in his system at the time of his death, a fact that shocked those that knew him. Ramsay’s insightful journey will help him understand a cooking process that he is totally unfamiliar with. The repulsive techniques used to make cocaine, the second most popular illegal drug in the world after cannabis, shocked the chef despite his exposure to the drug. With celebrities such as George Clooney, Lady Gaga, Oprah Winfrey and Naomi Campbell all admitting to having indulged in the drug, it would appear that Ramsay is correct in his claims that cocaine controls Hollywood. His two part documentary exposing the truth behind the drug is set to air on British television network ITV on October 19. In the meantime, this news report highlights the cocaine epidemic after Australian police seized a record 1.4 tons of the illegal substance.